Be the first to share your favorite memory, photo or story of Frank. This memorial page is dedicated for family, friends and future generations to celebrate the life of their loved one. Frank M. Kellogg, age 88 years. 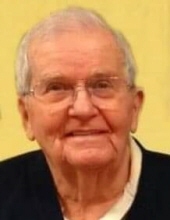 passed away at 9:05 pm on March 30, 2019 at Monmouth Nursing Home with his family by his side. Frank was born on June 28, 1930 in Peoria, Illinois and is the son of Clarence F. and Pearl Alexander Kellogg. Frank's early life was in Peoria and Monmouth, Illinois. He attended the Reynolds High School. Frank nobly served his country and was a Private First Class in the Army during the Korean War. He married Erma Jean Howe on April 5, 1949 in Monmouth, Illinois and she is surviving. Frank began work at the Ford Garage in Monmouth and later was at the Chevrolet Garage for a number of years. He then was partner with Jerry Sheese and owned and operated the Kellogg and Sheese Automotive Service here in Monmouth, for many years. Lastly the business was carried on by his son, Roger Kellogg. Frank is an active member and a past post commander of the Marion B. Fletcher Post 136 and a member of the J.W. Clendenin Post 2301, where he for a number of years was active in the Honor Guard presenting military honors for many. Frank was a member of the Burlington Moose Lodge 579 and is member of First Christian Church in Monmouth. Frank and Erma also enjoyed dancing and danced as often as they could. Surviving Frank is his wife Erma Jean Kellogg of Monmouth, Illinois and his son, Roger Kellogg also of Monmouth, Illinois. There are five granddaughters, Jeni Twist (Michael) of Athens, IL, Jesi Spears (Pat) of Monmouth, IL, Jaki Kellogg of Monmouth, IL, Jodi Brown of Alexis, IL, and Joni Kellogg (Bryon) of Urbana, IL. Also surviving are ten great grandchildren and several nieces and nephews. Frank is preceded in his death by his parents, one son, Gary, two sisters, and four brothers. Military honors and a memorial service for Frank M. Kellogg is planned on Thursday, April 11, 2019 at 11:00 am at Warren County Memorial Park Cemetery, as cremation rites have been accorded. A memorial fund is being established for the Monmouth Nursing Home. To send flowers or a remembrance gift to the family of Frank M. Kellogg, please visit our Tribute Store. "Email Address" would like to share the life celebration of Frank M. Kellogg. Click on the "link" to go to share a favorite memory or leave a condolence message for the family.